We like to get away as much as the next person, and sometimes a vacation just doesn't feel like a vacation unless you're miles and miles away from your day-to-day life. We travel to escape, to see new things, right? I'd argue that you can achieve all the same goals with a staycation, that is, a vacation right in your own backyard! (Not literally, but if you want to pitch a tent out back go for it!) Staycations became increasingly popular when the economy crashed about a decade ago. It was hard to justify that week-long trip to Disney when you just got laid off, but a weekend in a town just down the road was much more doable. Recently we were invited by AC Hotels, a Marriott brand, to experience our very own staycation at their property in North Hills, Raleigh. We've spent so much time away from the Triangle over the past two years that we jumped at the opportunity to spend a weekend checking out a part of our own area that we had barely explored. That's the thing about staycations - you really discover things that you never knew were right in front of you! I remember a science assignment from elementary or middle school that I had to do once. We were instructed to go into our own backyard, use string to measure out a one square foot plot of our lawn, and then document all the plant and animal life we came across over the course of a weekend. I saw so much in my own backyard that I never knew had existed! 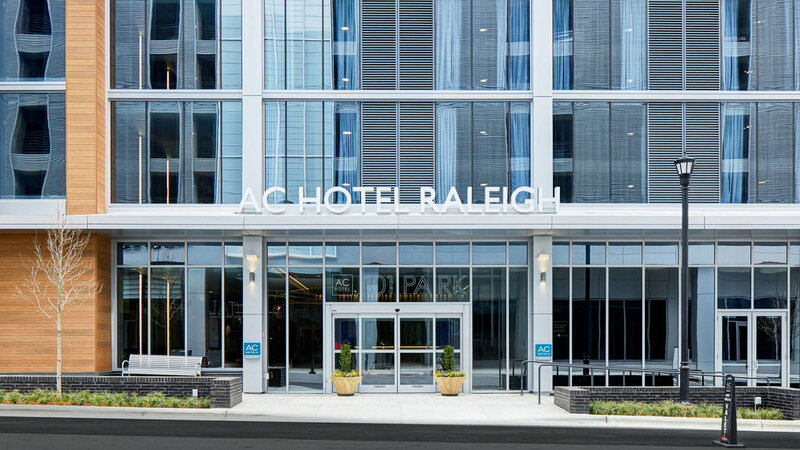 The AC Hotel North Hills is perfectly situated for a Triangle staycation. Smack-dab in the middle of the North Hills development you have dining, entertainment, and shopping right at your fingertips. Kings North Hills is perhaps the coolest bowling alley I've ever encountered. If you're a shopaholic just shoot across the street for a great selection of both chain stores and indy boutiques. Cowfish Burgers & Sushi is just that - great burgers and tasty sushi, located just a short stroll from the hotel. But you don't even have to leave the hotel if you don't want to. The Level7 Rooftop Bar was probably our favorite feature of AC Hotel North Hills. Part restaurant, part lounge, with live music and amazing views, Level7 was definitely the place to be. We went up for tapas and cocktails at night, and then returned the next morning to get some work done with a view. Pro tip: Mimosas increase productivity. Staycations are a great way of falling back in love with where you live. My recommendation for a great staycation would be to draw a circle on a map that encompasses everything within a two-hour drive. Look at the places within that circle, maybe start right at home and then work your way outward. Is there perhaps a town you've always wanted to visit thats right down the road? A museum you've yet to explore? Get in touch with local Visitors' Bureaus, search out unique hotels or B&Bs, or even just pack up the car for a day trip. Once you start living that #staycation life you'll quickly find that you don't need to board a plane just to have an adventure. Every staycation deserves a killer meat & cheese plate. We were invited to stay at AC Hotels North Hills by their PR team. Our room and meal at Level 7 was comped. The opinions expressed in this post are solely ours.